The Mend-A-Hose Jungle, set to host two pre-season warm-ups. Castleford Tigers have confirmed their warm-up matches ahead of the 2016 Super League season. 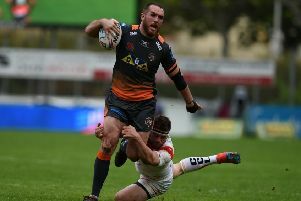 Daryl Powell’s men will take part in three friendly fixtures over the coming months with the possibility of a fourth to be arranged at a later time if it is considered necessary. First up, neighbours Featherstone Rovers will visit the Mend-A-Hose Jungle on Sunday, December 27, with a 1pm kick-off. The Tigers then take on York City Knights at Bootham Crescent on Friday, January 22, with a 7.30pm kick-off. The final friendly game as it stands now will take place at the Mend-A-Hose Jungle on Sunday, January 24 when Cas take on Wakefield Wildcats (kick-off 3pm) in a rehearsal for the Tigers’ first home Super League fixture against Wakefield Wildcats on Sunday, February 14. Tickets will be available to buy soon.